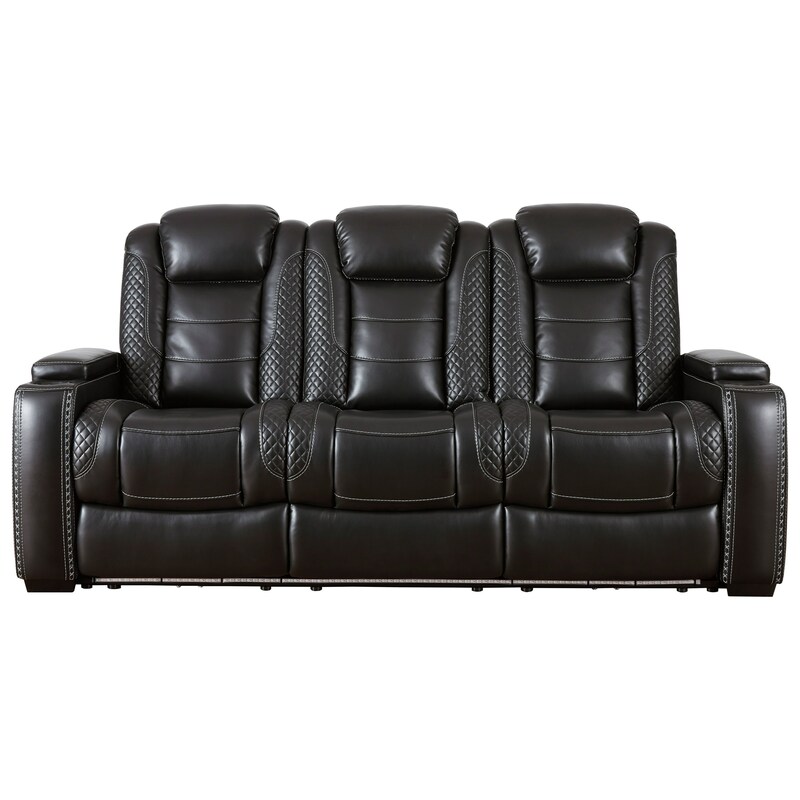 Feature packed, this faux leather power reclining sofa will create a cinema experience in the comfort of your own home. Enjoy the convenience of a power adjustable headrests and power recline with a built-in USB chargers. Plus, the additional benefits of two cup holders and two storage compartments built into each end arm of the sofa, a drop-down center table with built-in lighting, additional USB charging and power outlets, and LED blue theater lighting. For a finishing style touch, the sofa offers lattice accents and a versatile black faux leather cover. Distance required between loveseat and wall: 8"
The Party Time Faux Leather Power Reclining Sofa w/ Adjustable Headrests & Theater Lighting by Rooms Collection Three at Rooms Furniture in the Houston, Sugar Land, Katy, Missouri City, Texas area. Product availability may vary. Contact us for the most current availability on this product. Frame Construction Corner-blocked frame with metal reinforced seats. Frame components are secured with combinations of glue, blocks, interlocking panels and staples. The party is on with your choice of pieces available from this power reclining furniture collection. A balance between hi-tech features and a stylish contemporary design assure your entertainment space will be a hit. The Party Time collection is a great option if you are looking for Contemporary furniture in the Houston, Sugar Land, Katy, Missouri City, Texas area. Browse other items in the Party Time collection from Rooms Furniture in the Houston, Sugar Land, Katy, Missouri City, Texas area.